1. Put the lemon juice in a bowl and whisk in the olive oil, along with a good pinch of salt and some black pepper. 2. Holding each asparagus stalk by the woody end, shave the tender part lengthways into thin strips with a vegetable peeler, rotating the spear as you go. Thinly slice the leftover core with a knife and discard the woody end. 3. 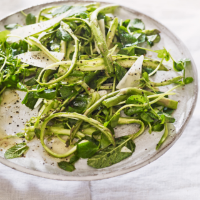 Put the asparagus in a bowl with most of the mint leaves and 2 handfuls of the pecorino shavings. Add 1-2 splashes of the dressing and all of the pea shoots, then toss together gently so everything is well coated. 4. Quickly divide between plates or bowls, adding a few extra shavings of pecorino to each, along with the remaining mint leaves and a little more dressing, if liked. Grind a little more black pepper over the top before serving.